Another course blessed by nature, Portsalon is not often mentioned internally as one of Irelands finest golfing jewels as it remains one of golf best kept secrets. Not only is it a magnificent test of golf , its setting is simply breathtaking. The three golden beaches of Ballymastocker Bay and the beauty of Lough Swilly and the Inishowen Peninsula beyond provide the backdrop for almost 7000 yards that will entrall any golfer. Redesigned in 2001 by Pat Ruddy, dune lined fairways, cannily placed bunkers and well protected greens are the hallmark of Portsalon. The opening holes are tough, six of the opening seven are into the prevailing wind. The second is a superb hole. More than 500 yards from the championchip tees, most mortals find the 440 yards from the medal tees enough of a challenge. A narrow strip of rough down the left separates the fairway from the strand. If you manage to hit it down the middle then you have to calculate if you have enough ammunition to carry the small river that traverses the fairway 20 yards in front of the green. A true golfers dilemma. The fourth is a 530-yard par 5 that brings you to the further out the course. You must keep it on the fairway between the mounds of dunes to have any chance of hitting it on in three. The green is one of two double greens (shared with the 8th). The 5th is the first of Portsalon's excellent par 3s. Usually downwind, watch for the two sandbunkers that will gather any ball straying left. The sixth is another dunelined par-4 that plays all of its 440 yards into the prevailing wind. Pars are usually made by chipping and putting on this index 1 rated hole. The seventh brings you the furthest point from the clubhouse, a slightly dogleg right par 4 with OOB not too far from the left and a bunker that will catch anything short and left. The 10th (137 yard par-3) and 11th (489 yard par-5) bring you back out to the far reaches of the course again before heading back for home. The 13th is a wonderful par 4 that tightens to a narrow channel. Drive too far left and you will be blocked by trees, too far right you will end up in a grassy hollow with a blind shot to target. Watch out for the sand-bunker that is hidden from view 10 yards in front of the green, many a ‘perfect' approach has ended up there. From the elevated tee on the 14 th you have a wonderful view of the hole ahead. Aim for the painted rock facing you on the dune or if you are feeling lucky with a tail wind you can take a more direct route and drive further right and hope to knock 20 or 30 yards off your second. The green is a monster shared with the 3rd hole. The 15th is a fine par three, not too long at 175 yards, anything short or left is in great danger of sand and two putts on a tricky green is very acceptable. The 16th is a lovely par-4 with a parkland feel, a blind teeshot will leave you with a mid to short iron to the green. Some 20 yards short of the green you will once again have to negotiate the same stream that traverses the 2nd fairway. The 17th is a par-5 that doglegs to the left at about 250 yards. From there the fairway rises gently to the green that is unreachable in two for all but the biggest of hitters. The green is set back some 20 yards from the crest of the hill so many tend to leave the approach on the front edge rather than the centre of the green. The 18th is a tough closing hole, OOB all along the left, you drive out over the underground pedestrian access to the beach. The approach is difficult to a slightly elevated green, short and you will probably roll back into a little hidden stream 10 yards in front of the green, anything long could well end up in the clubhouse driveway. Portsalon is a truly natural links, with most of the course set in glorious duneland beside the Atlantic. It is a course that should not be underestimated even by the most experienced golfer. It will not be long before this course shares the limelight with the Donegal, Sandy Hills and Glashedy as the best courses in the north-west. 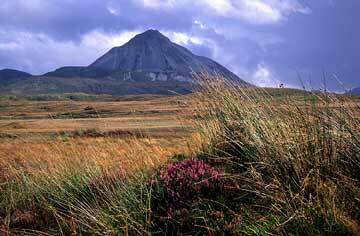 For a guide to golf in northwest Ireland visit our regional golf pages. For a complete lost of golf courses in northwest Ireland visit our Ireland Golf Directory.